Diane Bruni has been practicing yoga for 35 years, teaching students for 20 years, and training teachers for nearly two decades. 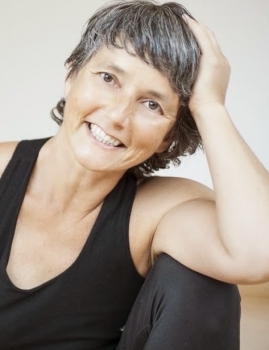 Diane was the first Ashtanga yoga teacher in Canada. She co-founded the Downward Dog Yoga Centre, and hosted an internationally aired television series called Breathing Space Yoga. Diane is actively researching alternative therapeutic movement practices, believing that diversity in practice is the key to longevity. Her common sense approach allows her to integrate new ideas and movement patterns, allowing yogis of all levels new opportunities for growth, exploration and possibilities. The Body Loop can be used in restorative postures in place of bolsters, straps and blankets. The Body Loops can also be worn to help people feel the shoulder loop actions in the upper body, relieving strain in overused muscles while improving posture. Gentle movements with the Body Loop helps people feel more connected to their bodies as they move in non-linear patterns. As we age our tissues become less resilient. Like an old elastic band that just doesn’t bounce back, our bodies function in much the same way. Stretching alone won’t help. In fact, too much stretching could lead to over stretching and weakening of the muscles and connective tissues. Staying resilient as we age takes practise, we become we what train into our bodies. This workshop is designed for people who have noticed that they’re losing that springy feeling that comes with youth and want to learn how to bring the spring back into their bodies and lives. As many yoga practitioners have discovered going to end range in poses can lead to instability, hyper-mobility, pain and injury. Using the Body Loop in yoga poses provides resistance and support at the end range encouraging more muscle activation, recruitment and joint stability. The Body Loop trains more strength into yoga postures - rather than doing poses passively using the Body Loop encourages a dynamic relationship with the pose. This challenge is perfect for beginners and helps long time practitioners who have become flexible, find the strength they need to stabilize. In this full day workshop, you will be introduced to the versatility of the Body Loop, a resistance and support device that enhances proprioception input while improving coordination, breathing biomechanics and posture. By providing sensory feedback from mechanoreceptors and fascia, the Body Loop retrains posture across the kinetic chain. If you are living with recurring injury, hyper-mobility, or crave more vitality and you need safe ways to build strength and resilience in your practice, the Body Loop provides many accessible and creative options for to integrate into your yoga practice. With their many years of combined experience in movement and recovery, you will walk away with new ways to approach your body, movement and somatic awareness.